The plan was to low-pollard the faster growing limes to give more space for the slower growing oaks. Pollarding reduces the height of the tree to around 3 or 4 foot, but it will continue to grow new shoots leading to a bushier shape. Trees pollarded in previous seasons all have new growth and provide a range of heights and age structure to the wood – the trees are not all the same height. 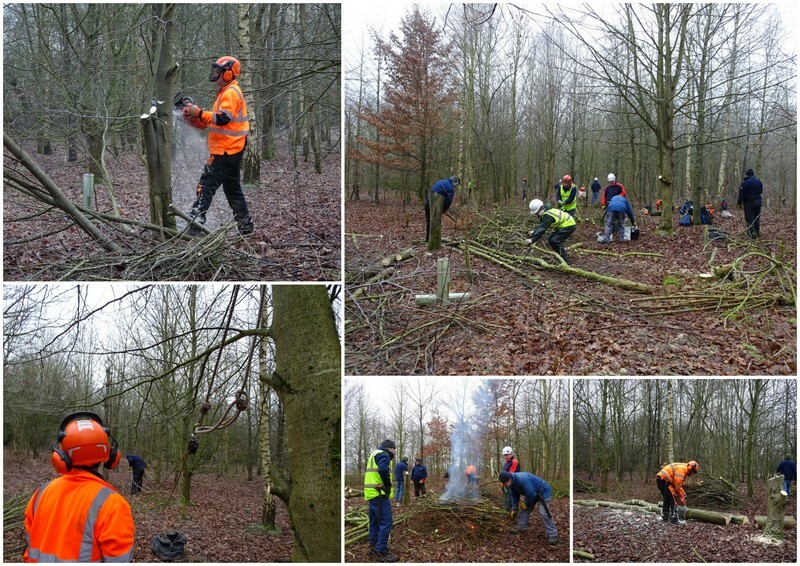 Our volunteers cut back the smaller trees while Matt dealt with the larger trees with his chainsaw. We used our rope and pulley system to guide the larger felled trees so that they landed between remaining trees. It was a cold and frosty Thursday, but we soon had the fire lit to warm us all up and also burn all the brash. Larger logs were stacked for use as firewood. So, we had a couple of days of cutting dragging and burning in a pleasant woodland. The fire was ready to go on the milder Friday and we worked steadily through the area. A special treat on Thursday was fruit cake made by Matt. The fruit was flavoured with rum and Matt had added extra rum to the cake just in case, so it was very tasty and warming! Last season we were coppicing hazel in a different area of the wood (see blogs The Coppicing Continues and A Final Visit For A While) and when we walked around to see how things looked now, we found that the coppiced trees had regrown to around 5-foot-tall over the past year. This will thicken-up and continue to grow until ready for coppicing again in around ten years. 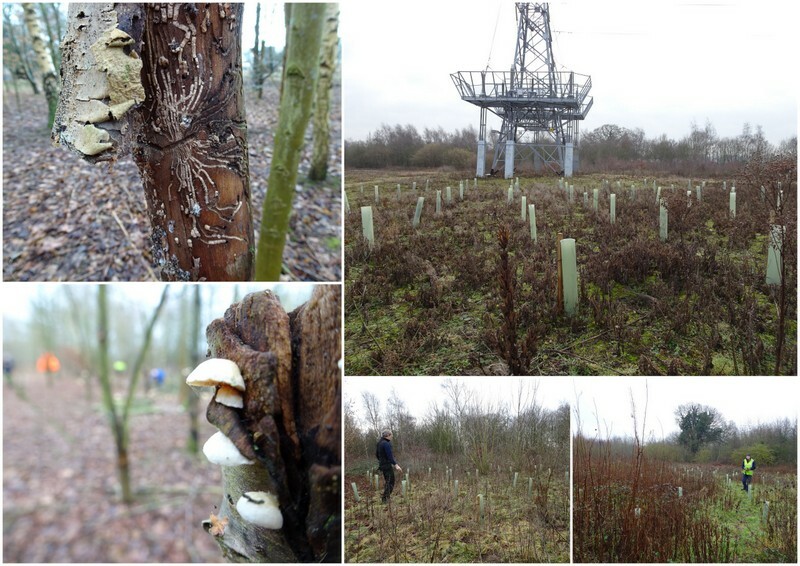 We also planted lots of new trees last season (see blog Extending The Tree Belt), and a check on how these had fared during the hot summer we found that most seemed to have survived the hot Summer. All will become clearer in the Spring when new shoots and buds start to appear. 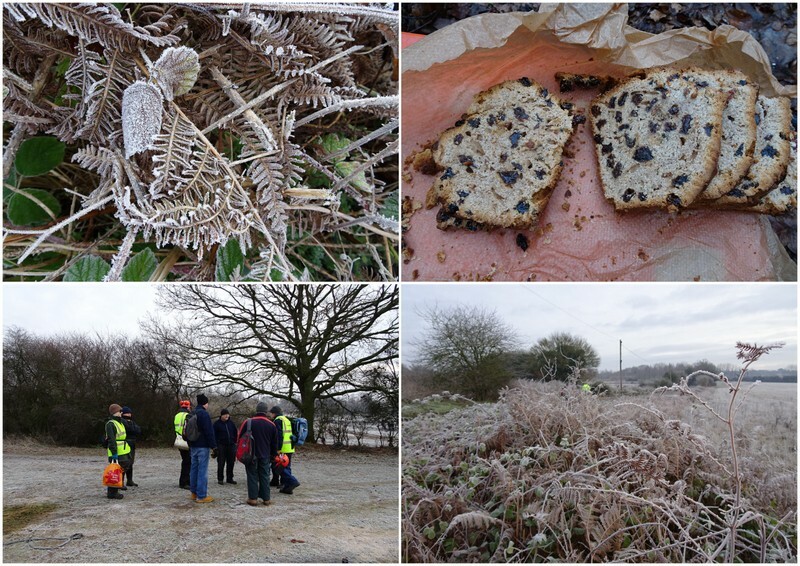 As ever, Robert’s photos record what we have been up to on our work days but also capture some wonderful images of the flora and fauna around the sites. Robert regularly spots and records interesting looking stuff and this week it was some very intricate patterns on standing deadwood formed by wood boring beetles. They look as if they have been carved by an expert craftsperson but are just the meanderings of a beetle. At this time of year there is also a lot of interesting fungi to be seen and when an unusual or rare one is sighted, Michelle, who puts together our Blogs and photos will notify these to the appropriate County Recorder. Spotting and reporting such sightings enable bodies such as the Norfolk Biodiversity Information Service to build a picture of wildlife in the County and helps to protect this.